There are many ways you can find your dream hotel around the Costa Blanca. The best way to start is to get at least an idea which area of the Costa Blanca you think of spending your holidays at. With a coastline length of about 160 km ( approx. 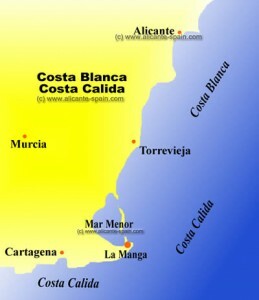 100 miles), the Costa Blanca hosts dozens of cities and towns at all sizes. We have put together various hotel recommendation lists for cheap and luxury Costa Blanca hotels in a variety of cities. Most of these recommendations come either from our own personal experience (having friends or family stay at these hotels while they are visiting us – since we are living in Alicante) or from reviews of our website readers. Benidorm Hotels – Most likely the best known city among tourists, Benidorm attracts hundreds of thousands of tourists every year. Being the top location for many travelers especially from the UK, it hosts hundreds of hotels, ranging from cheap to top class hotels. Our Benidorm hotel recommendation list should give you a good starting point on finding the right Costa Blanca hotel in Benidorm for you. Altea Hotels – A bit north of Benidorm lies the city of Altea. Directly located at the Costa Blanca, it is well known for its beautiful historic city centre and the very nice beaches. A great town/city for a bit a quieter holiday. We recommend several very good hotels for Altea, Costa Blanca here. Calpe Hotels – Following the Costa Blanca Carretera Nacional (national road) to the north you get to Calpe. This vivid city is famous for its impressive rock (penon l’fach) and its excellent sea-food restaurants along the two main beaches. Our recommendation list for Calpe hotels covers several 4 star Costa Blanca hotels here. Javea Hotels – To the very northern part of the Costa Blanca lies the area around Javea. This area, famous especially for tourists from Germany, Switzerland and the Netherlands, is a bit more quiet than the area around Benidorm. Among many activities – watersports is big here, with many lovely hidden beaches around. Denia Hotels – The last real big city at the northern end of the Costa Blanca is Denia. Well known for its ferry connections to Ibiza, one of its treasures is the spectacular harbour – hosting fishing boats as well as impressive yachts. A great place if you plan on doing several day-trips around. Our list of recommended Denia hotels for this part of the Costa Blanca is here. Alicante Hotels – Literally at the center of the Costa Blanca lies Alicante, capital of the region. 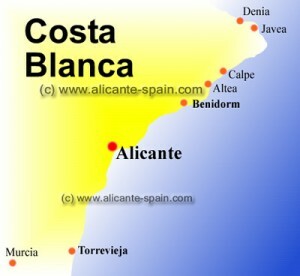 With around 350.000+ inhabitants the largest city at the Costa Blanca. Our Alicante hotel review list covers a wide range of hotels from cheap to medium and first class places. Torrevieja Hotels – A list of 3 star and 4 star hotels at the southern Costa Blanca. In or slightly outside of Torrevieja. Murcia Hotels – Murcia is especially interesting to those who are planning golf vacations around the southern Costa Blanca and Costa Calida area. Our Murcia hotels page lists several recommended hotels for this area. La Manga Hotels – Located at the very southern end of the Costa Blanca (well, actually at the Costa Calida ), the area around La Manga del Mar Menor is famous for its lagoon and its excellent golf facilities. Or hotel list covers luxury 5 star costa blanca hotels as well as 4 star and even 2 star apartment lodgings. This is our overview on several different areas where you can find really good hotels around the Costa Blanca.